Islam is the way that leads to the Lord, Allah. Like any other way, the soul of Islam, Sufism, requires the seeker of Allah to pass different stages to become One. The very first stage is sharia then the intermediary stages are tariqa, reality (haqiqa) and gnosis (marifa) whereas the last one is Faqr (Oneness). The base of all of them is the ardent Divine love (Ishq). Unless one does not feel the love of Allah with all the passion how can he cross all these stages! Moreover, crossing all the aforementioned stages is mandatory otherwise reaching destination will remain only a dream. There are five stages of Divine love. How Divine love is nourished? First being sharia and it is to hear the beautiful attributes of Allah which nourishes love. How Divine love is aroused? Second is tariqa which is to seek the Beloved and follow Him. Third is the reality (haqiqa) and it is that where thoughts circle only the One. Fourth is gnosis (marifa) which is to perish one’s desires for the Beloved’s. Fifth is Oneness and it is to annihilate the entire entity both exoteric and esoteric and attain complete immortality with Allah. When one crosses all these five stages successfully then there remains nothing but ardent Divine love. The love and lover like a wave submerge into the ocean of the Beloved. Sharia among the masses is famous as the exoteric commands of Quran and Sunna whereas esoterically the same is tariqa. A simple example could be that ablution as defined in sharia is to purify one’s body and ablution of tariqa is inward’s purification from satanic and lustful diseases. What is core of sharia? When a seeker takes the first step to reach Allah, he soon realizes that he only knows that Allah is God but is unaware of His Essence and attributes. Then he starts to recognize Him through worships. After performing these worships with utmost fervor and zeal he then reaches tariqa. Here an intense desire arouses within to see the most magnificent Allah. Uncontrollably moves forward to such heights that though outwardly he is in world but esoterically forever remains engrossed in the thoughts of the Beloved due to which idols begin to fade and He manifests. A seeker cannot travel through all the stages solely by his worships rather the mediation of the perfect spiritual guide is compulsory. If anyone thinks the opposite then he is engulfed by the deceits of Satan and is depraved. One should follow four spiritual guides; spiritual guide of sharia, spiritual guide of tariqa, spiritual guide of reality and spiritual guide of gnosis. Who is spiritual guide of sharia? He is the one who teaches the basic pillars of Islam which are Islamic creed (Kalimah Tayyibah), salat, fasting, zakat and hajj. 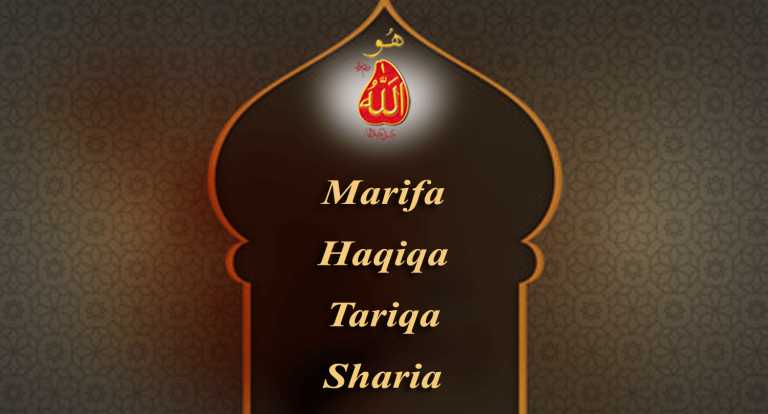 Who is spiritual guide of tariqa? One who makes his disciples the true slaves of Allah and detaches them from both the worlds. Who is spiritual guide of the reality? He is the one who persuades his disciples to sacrifice their lives for Allah. Sultan Bahoo further says that worship, endeavour and abstinence which does not take one to Allah’s gnosis and union is mere deceit and apostasy. The scholars, jurists, judges, rulers and kings investigate and check thousands of people on the basis of sharia but never check or investigate their own innerself (nafs) even once in their life. However, the Fakirs always keep check upon their innerselves and hold it accountable day and night. After this accountability, the Divine love which is like a judge in their being orders to kill the innerself, the love which is the jurist orders to behead it while the invocation and meditation act like a ruler and issue the order to imprison it with the chains of sincerity to Allah and put a necklet of obedience to sharia around its neck. If one truly desires to be bestowed by Allah’s favours and to find the blessing of proximity and union then all the stages of sharia, tariqa, reality and gnosis must be excelled at. Like water becomes pungent and polluted if it halts at a place, same is human’s journey for soul gets trapped into the deception of innerself and Satan if it stays at a station for too long. O Ghawth al-Azam! Once you have intended to enter My sacred court then do not incline towards material world (alam an-nasut), realm of angels (alam al-malakut) and realm of power (alam al-jabarut). As world is Satan of scholar, realm of angels is Satan of a Mystic and realm of power is Satan of the experienced. Thus who inclined towards any of them is among the condemned. Important to realize is that to cover all the stages of Sufism one does need guidance from the perfect spiritual guide for he knows all the waystations, hurdles and veils of the path. Without him one cannot understand the reality of sharia in order to follow it truly then how is it possible to understand the rest of the stages. Only the perfect and accomplished spiritual guide of the Sarwari Qadri order is aware of all the waystations. He knows all the difficulties and their solutions on the way of sharia, tariqa, reality and gnosis. This is because his soul resides in realm of Divinity (alam al-LaHoot) and has bequeathed the treasure of Faqr. He takes the seeker from this material world to the realm of Divinity under his supervision and does not let him become stagnant at a station nor let him get engulfed in satanic whispers. It is the perfect and accomplished spiritual guide because of whom the Sarwari Qadri order has superiority over all the other spiritual orders. Also other orders reach only to the Divine attributes at their peak but Sarwari Qadri order’s peak is the Divine Essence and the attributes. On the night of Miraj, the Prophet mounted al-Buraq and Archangel Gabriel escorted him. The whole universe was decorated and eighteen thousand worlds were adorned and presented before him. From there onwards, Gabriel stopped advancing (as he could not go beyond the realm of power for it is only the destiny of human beings). Additionally they progress in proximity to Allah every moment. On reaching the heaven of proximity they neither grieve nor fear. Divine favour is always with them. Satan cannot mislead them due to their pure intentions. This is all the beneficence of the perfect and accomplished spiritual guide. Understand that sharia is honour, tariqa is actions, reality is states and gnosis is union. Between sharia and tariqa lie seventy thousand great veils of all that is other than Allah of which the greatest is that knowledge which gives birth to arrogance and lustful desires. Human unless frees himself from egoism, arrogance and lust cannot reach reality. Similarly between tariqa and reality there are seventy thousand great veils of unveiling (kashf) and miracles. Unless man frees himself from them, he cannot reach reality. There are seventy thousand veils of attributes between reality and gnosis. A Mystic should stop desiring gnosis in the court of Allah (and leave all matters to His will) to dive into the ocean of annihilation. Sharia means to devotedly go against the evil of the Satan. The basic conditions of sharia are; to order towards gnosis and do good deeds, to feel ashamed of disobeying Allah, eat only that is allowed, speak the truth, have know-how of major and minor sins, acquire knowledge and wisdom, fortify oneself by religious obligations, Sunna, compulsory and desirable acts and worship within this fortification by the grace and help of Allah. The precondition in tariqa is to have speed, just like a falcon who reaches its destination in no time. While in reality the condition is to take Allah as the sole Reality i.e. to believe that only He exists, whatever happens is from Him. Do not dare to object my friend! Meaning: The good and evil both are from Allah. Understand that at all the four stages (sharia, tariqa, reality and gnosis), there are spiritual states of contraction (qabd), expansion (bast) and intoxication (sukr), while at the level of Tariqa there is agony also. May Allah save us from the agony of death, especially the unexpected sudden death! Whether the seeker is at initial, intermediary or final level, as soon as he enters the level of tariqa he starts understanding his spiritual states and guards himself from evil. Reciting blessings and salutations in the state of ecstasy keeps one safe. Sharia is like breath of a person and tariqa is like step, a person takes step when he intends to start a journey. The present accomplished spiritual guide of Sarwari Qadri order Sultan-ul-Ashiqeen Sultan Mohammad Najib-ur-Rehman toils hard day and night to guide seekers of Allah on the path of Truth. He cleanses the rusty inwards through his celestial company, alchemic sight, invocation and contemplation of Ism-e-Allah Zaat. He guides them in covering the stages of sharia, tariqa, reality and gnosis. There are innumerous examples in the form of his disciples whose souls have ascended to the realm of Divinity and have presence in the Mohammadan Assembly without extra mystic endeavours. Open invitation for every traveller to pledge oath on the hands of Sultan-ul-Ashiqeen Sultan Mohammad Najib-ur-Rehman. Specially, for those who wish to progress through sharia, tariqa, reality and gnosis and wants to accomplish Faqr and Divine love. This is the only way to be successful in both the world and the hereafter. The doors which leads to the Truth are open for those seekers of faith who wish to understand teachings of Islam to the very depth and to practice it for Divine proximity.